Phase 1: Understand the current process and areas of improvements through observations, chart reviews, and interviews. Phase 2: Development, simulation, and implementation of a new handoff process using data collected from Phase 1. Phase 3: Evaluation of new process through observations, chart reviews, interviews and surveys (In progress). After extensive observations and interviews, our research team designed a standardized handoff protocol to be used both at in the Rhoads 5 SICU at HUP and the PAC4-TSICU at PPMC. The overall process can be seen below on the two posters. In this sense, we want to create a post-op time out where (in the best case scenario) all four providers can come together to discuss the transfer of the patient and information. The purpose of this process is to refine communication between clinicians caring for postsurgical patients. In this sense, we want to create a post-op time out where (in the best-case scenario) all four providers can come together to discuss the transfer of the patient and information. 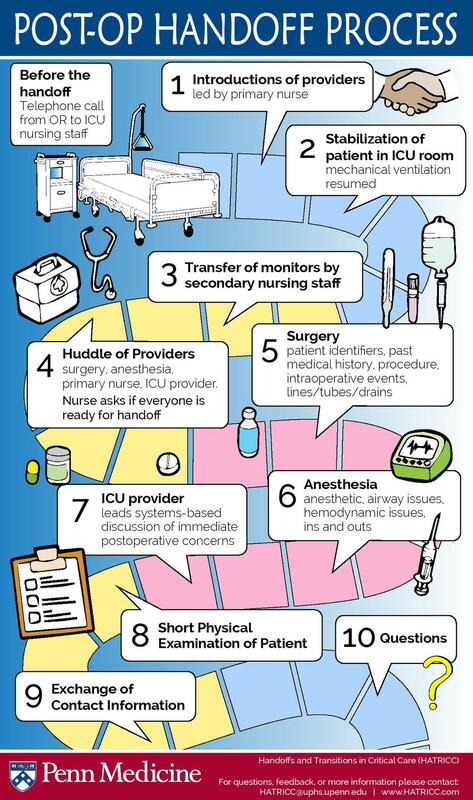 First, OR staff will call up to the ICU staff prior to patient transport to discuss need-to-know information to allow ICU to prep for patient arrival. At PPMC, the CRNA responsible for patient will make this phone call. At HUP, the OR nurse will be responsible for call. Steps 1 and 2: Upon patient arrival, the primary nurse will ask all providers to introduce themselves. (ex: "Who is my surgical provider?"). Patient is stabilized in room and mechanical ventilation is resumed. Steps 3 and 4: Secondary nursing staff transfers patient monitors while providers gather, primary nurse asks if everyone is ready for handoff and waits for assent before continuing. Steps 5 and 6: OR staff, including surgical team followed by anesthesia team, presents patient information. Steps 7 and 8: ICU provider leads a systems-based discussion of immediate postoperative concerns, followed up by nurse. By this time, a short physical examination of patient should occur to make sure all providers are aware of dressings, lines, drains, etc. Step 9: Team exchanges contact information. Step 10: Any remaining questions about patient are addressed. The handoff is considered complete once all providers are satisfied all questions have been answered. In addition to the Post-Op Process Flow Chart, thereis a removable, laminated Patient-Information Chart (see poster above). This chart is designed to be used by providers to record relevant handoff information including patient history, procedure details, team contact information, and more. This serves to prompt relevant patient details that should be discussed during a handoff, but is not meant to limit the discussion of patient information to what is only covered on the chart. Note: Because this process was designed for a general SICU, the patient chart shows only the basic information due to the variety of patient cases. The HATRICC protocol rolled out in the Rhoads 5 SICU at HUP on June 1, 2015 and in the PAC4-TSICU at PPMC on June 15, 2015. As of fall 2018, our research team continues to observe handoffs in the ICU. The success of this protocol is entirely dependent on the support from both the ICU and OR staff. It is our goal to make this process as helpful and smooth as possible. Indeed, we hope to improve not only communication and teamwork between providers, but also better patient care and safety.